The death of political prisoners in custody is a tragedy that this country’s leaders regularly try to hide. 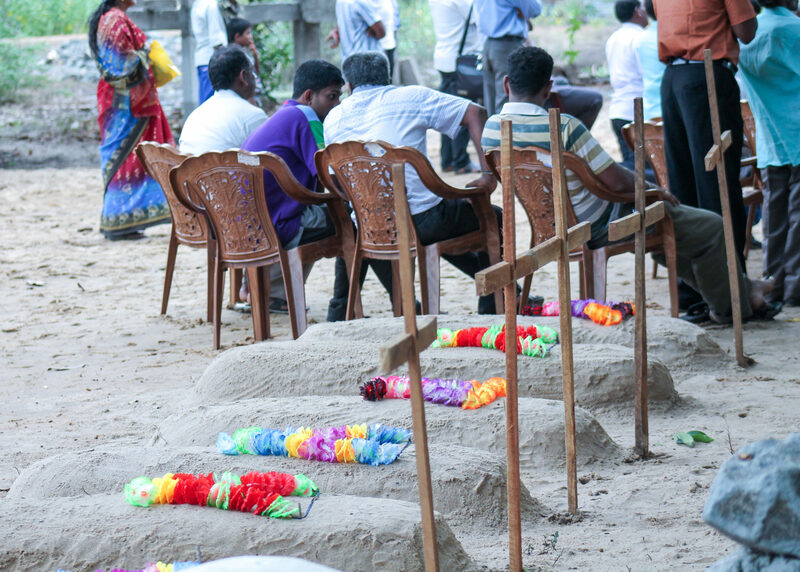 In Nimalaruban’s and other iconic cases, court orders were issued dictating the precise way in which the funerals were to be conducted. 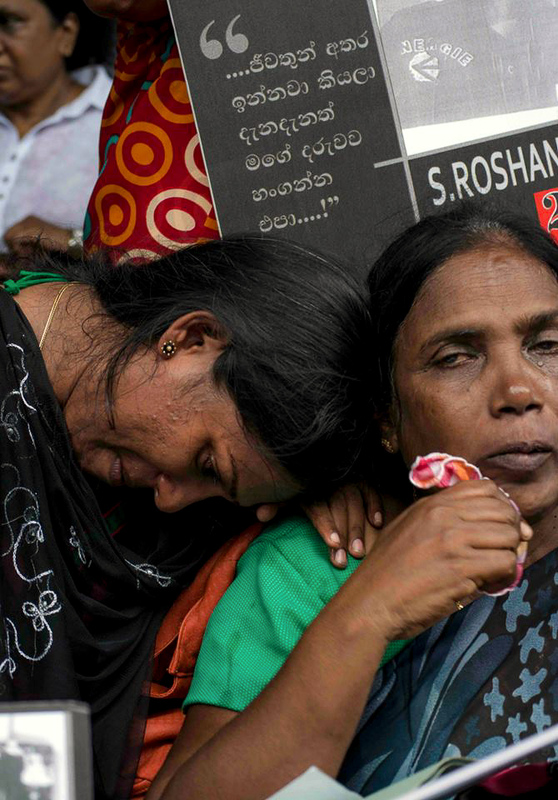 In June 2012, two Tamil prisoners Ganesan Nimalaruban (age 28) and Mariyadas Delrukshan (age 34) detained under national security law-died after being severely beaten by prison officials as punishment for their involvement in a prison riot. These two prisoners had participated in a riot in the Vavuniya prison on 28 June 2012. They were protesting their prolonged detention without charges. During the riot, prisoners held prison guards hostage. 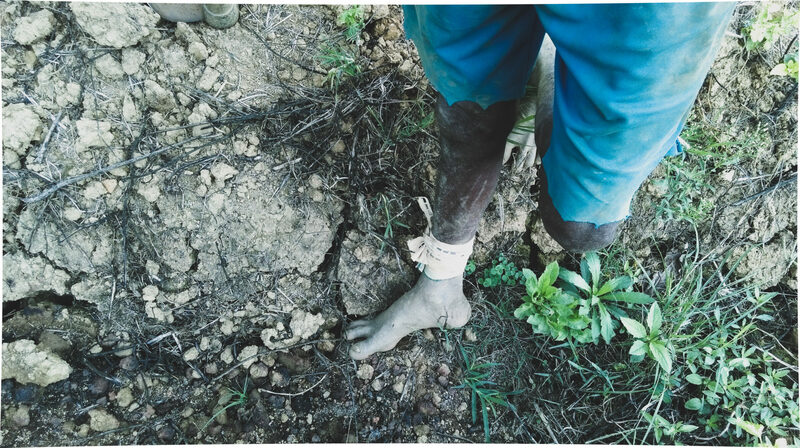 The guards were freed the following day by a rescue operation.After the operation, the prisoners were transferred from Vavuniya to Anuradhapura, where they were severely beaten by prison guards. ආණ්ඩුවේ බන්ධනාගාරයක් තුළ දී රැදවියන් ඝාතනය කිරීමේ අතීතයක් අපිට තියෙනවා. විශේෂයෙන්ම දේශපාලන රැඳවියන් ඝාතනය කිරීම සම්බන්ධව අතීතය මෙරට පාලකයන් විසින් නිරන්තරයෙන්ම සුදු හුණු ගසා වසාදමන්නට උත්සහ ගන්නක් . 2011 වසරේදී ලංකාවේ සිර මැදිරියක් තුළදී පහරදී දෙමළ දේශපාලන සිරකරුවන් ඝාතනය කළා. අධිකරණ නියෝග පවා නිකුත් කොට ඒ අනුව මියගිය දේශපාලන රැදවියන්ගේ අවමගුල් සිදු කිරීමට ඥාතීන්ට බලකිරීමට තරම් එවක පාලනය මුග්ද හා දරඳඩු වුනා. 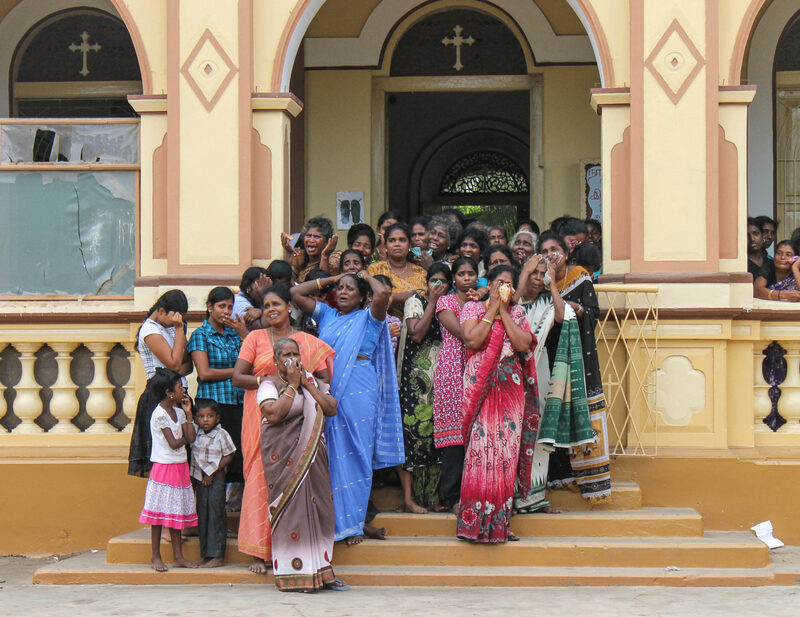 8th August 2012 Paithakuur, Jaffna. 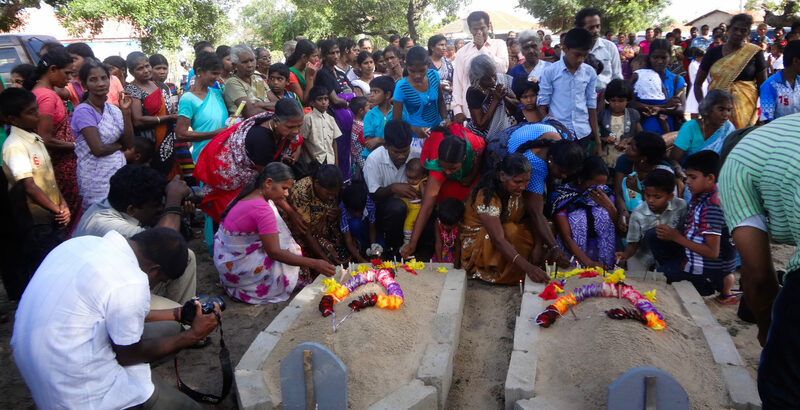 Performing the Funeral traditions by his mourning relatives under high security for 34 Year Delruxon Mariyathas who was admitted to hospital in a coma after he was severely beaten, injured and eventually died. 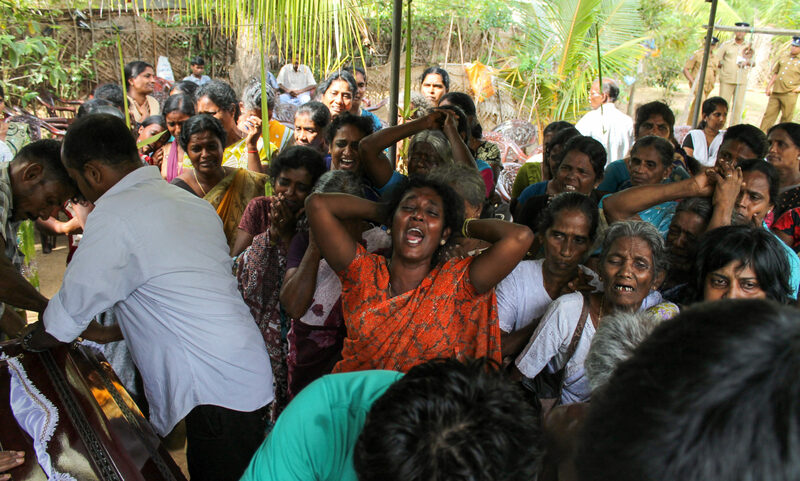 24th July 2012 Parents and Relatives weep at Nimalarooban’ s house,where he lived and his body was kept, Nelumkulama, Vavuniya. 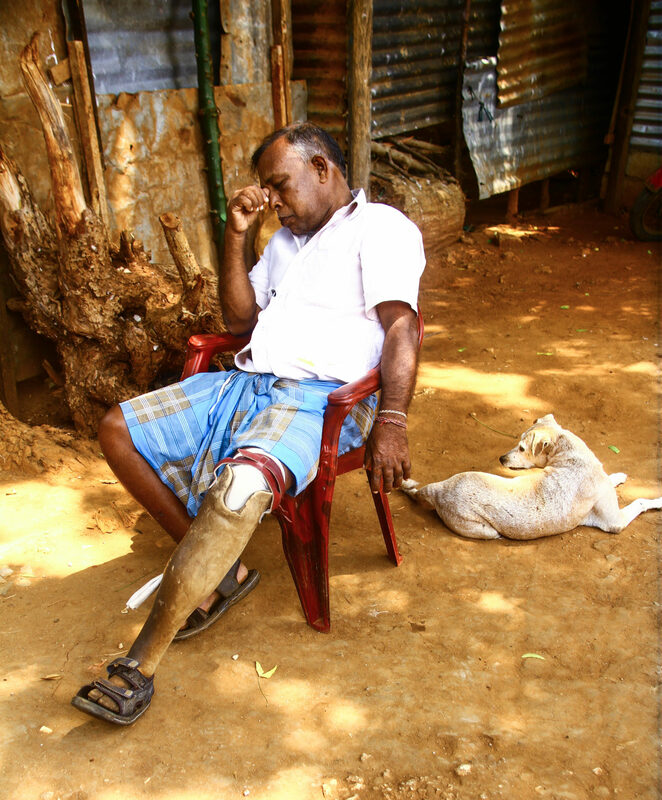 Ganesan Nimalaruban suffered severe injuries and was subsequently transferred to Mahara prison. 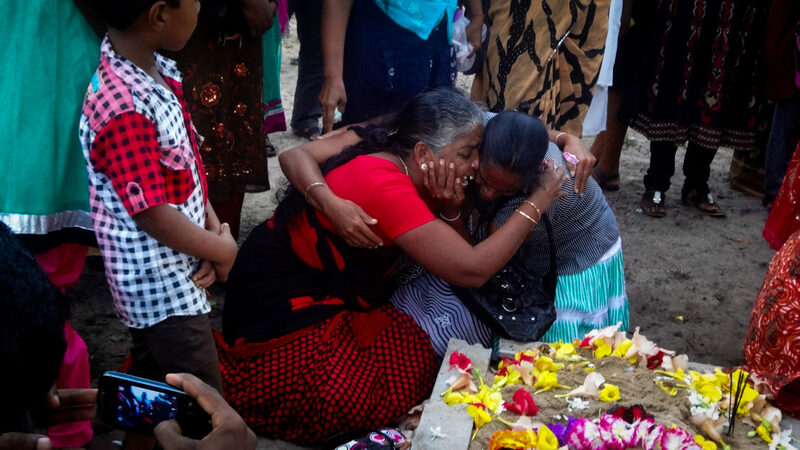 Shortly thereafter, he was admitted to Ragama Hospital, where he died five days after the riot.Following his death, the authorities initially refused to release his body or allow him to be buried in Vavuniya, his hometown, citing national security concerns. 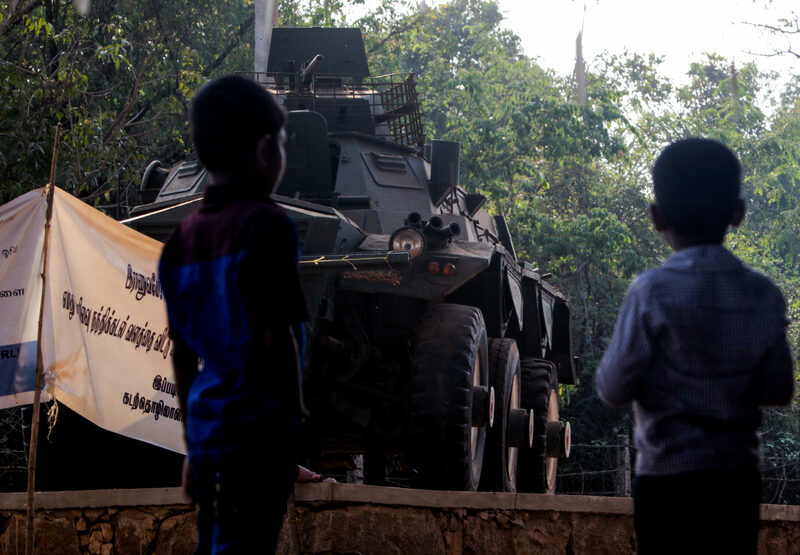 8 years after the war ended, the North is still heavily-militarized, and its residents live under the shadow of the forces. Cultivated land belonging to citizens for generations are taken over by military, in an effort to hold more control over the people. These are the hallmarks of tragedy; dispossession of fundamental rights and a citizen’s own land by the State. The Army Helmet Captured above was taken in July 2017 in Kankasanthurei in a released land by SL Army to Civilians. This is a very symbolic representation of hidden presence of the military in people’s lives even after these lands are being released to them. අපි යුද්ධයෙන් වසර 8ක් ගත වුවත් මානසිකවම තවමත් යුදකාමී මිලිටරියක හා අධිපතිමය බලයක් සතු බර අඩි සහිත බුට් සපත්තු වලින් බැටකමින් සිටිනවා. තවතවත් නීති්‍යානුකූල ලෙසම ගොවිබිම්, හමුදාබිම් බවට පෙරලමින් ගෝත්‍රික ජාතියක් බවට ද ඒ අනුවම ලංකා දිවයින පත්වෙමින් තිබෙනවා. ජිවිතයේ අවම අයිතිය හා තම භුමිය ස්වකිය රාජ්‍ය විසින්ම කොල්ලකෑමේ ඛේදය දරුණු බවට මේ සාක්ෂීන් ය. පානම කියන්නේ යුද්ධය පැවති කාලයේ සියලු පාර්ශවයෙන්ම බැට කෑ ගමක්. බහුතරයක් සිංහල වුනත් දෙමළ හා මුස්ලිම් ජනයාත් මෙහි ජිවත් වෙනවා, ඇත්තටම මෙය සහජීවනයේ නගරයක්. එහෙත් යුද්ධය අවසන් වීමෙන් පසුවත් තවදුරටත් තමන් ජිවත් වෙච්ච භුමිය අමතක කර දමා සිටින්නට මේ ගොවි ජනයාට මෙරට මිලිටරිය බල කරමින් සිටින්නේ භුමියේ අයිතිය වෙනුවෙන් නොනවතින අරගල කරමින් පාරට බසින්නට ද සිදු කරමින්. බඩගිනි නිවා ගැනීමේ අරගලයද, ජිවිතය ගැටගසා ගැනීමේ අරගලයට ද දශක ගණනාවක් මහපොළොව සමඟ ඔට්ටු වුනු මේ මිනිසුන් තවමත් පාලකයාට ඇති ඔවුනට නැති සාමය වෙනුවෙන් සටන් වදිමින් දාඩිය වගුරනවා. 21st June 2016 Panama , A protest for the rights of land by people. 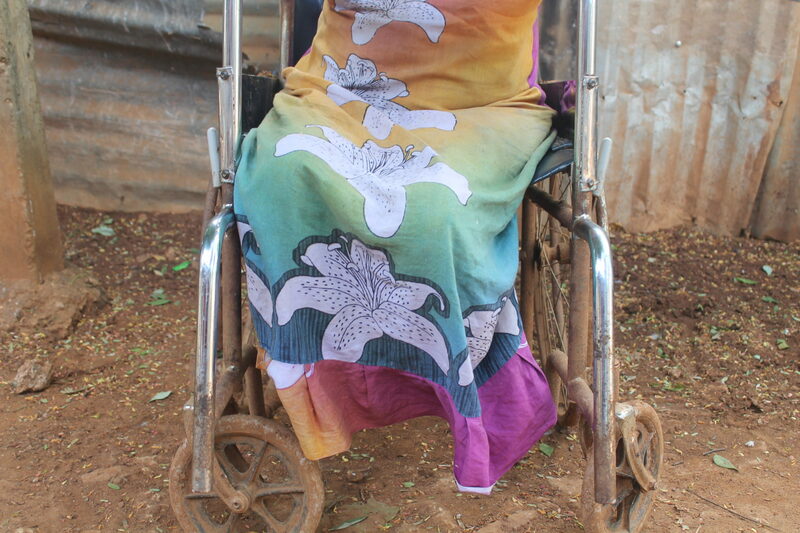 Paanama was one of the villages that suffered at the hands of several armed groups during the time of the war. 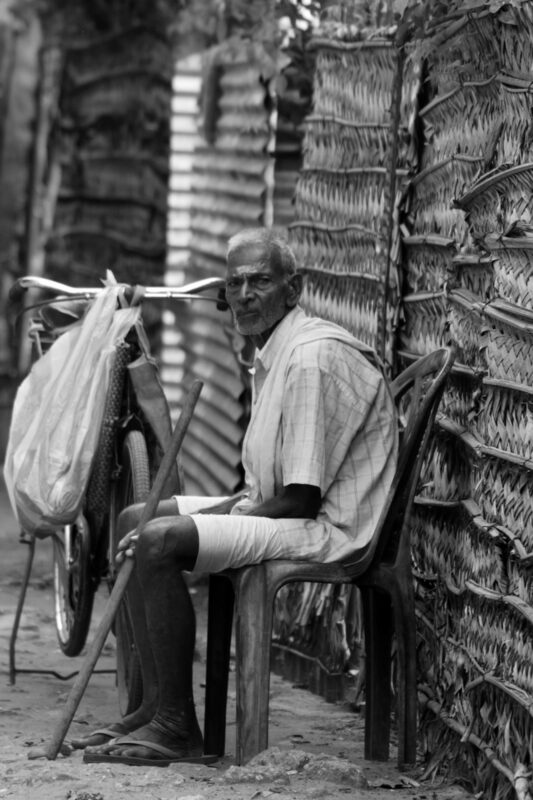 Although the majority population is Sinhalese, Muslims and Tamils also call it home – it is a model village of unity and solidarity. 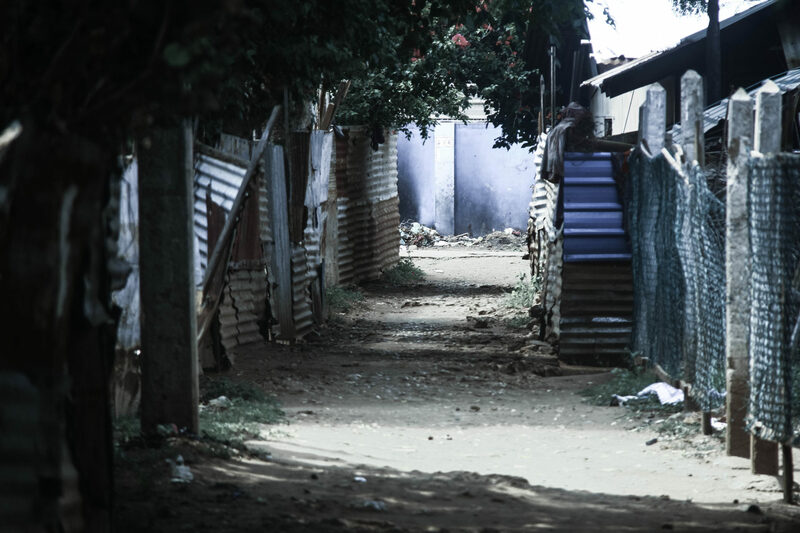 They continue to suffer after the war, as their lands have been grabbed by the military. These people fight for their own lands which are now being enjoyed by those who rule, and not the rightful citizens owners. 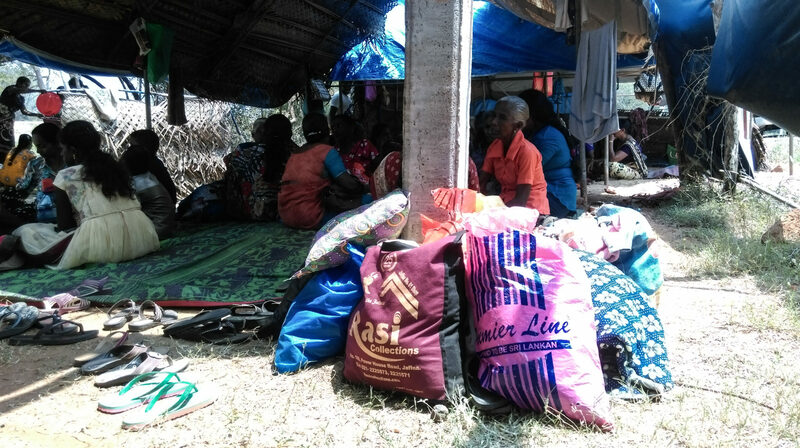 Several Families had to pay off from their wealth earned during the whole life since thousands of houses got damaged totally while some were cracked and at alarm notice. Fertile agricultural lands, All the huge water sources of this upcountry wetlands have got dried pathetically. 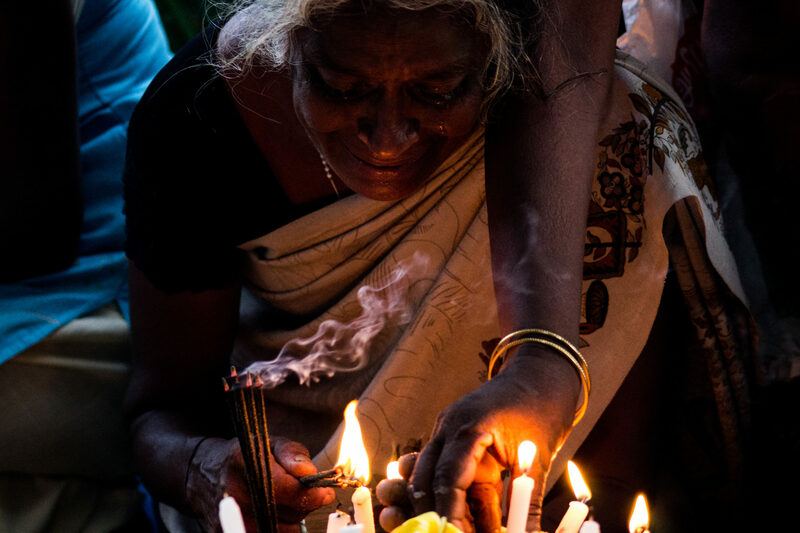 April 2016 Mullikulam People pray to god asking to help them to get released their lands at a day and night protest called “Last Will”. On the day the photo captured it was 11 years for their refugee life, and they asked the government to give back their lands of traditional fishing industry and their homes. Yet their last will is not being given by the government or heard by any kind of god. 21st June 2016 Panama, A protest for the rights of land by people. 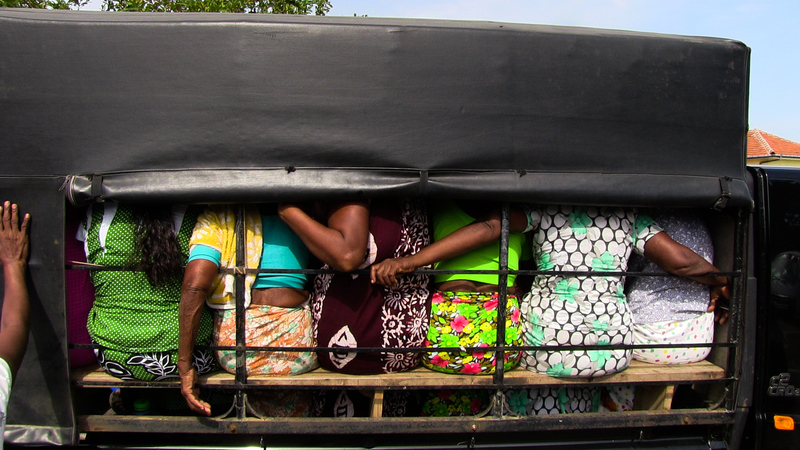 A lorry filled with women protesters. 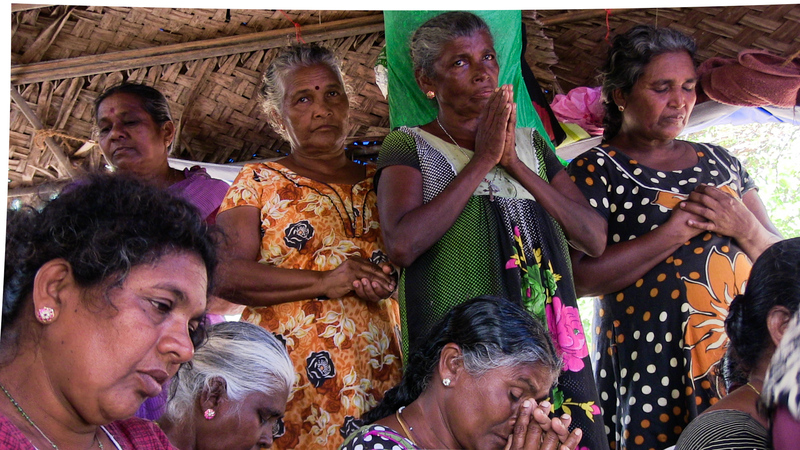 Throughout the struggle called “Justice for Paanama” village women played a significant and major role in demanding justice. 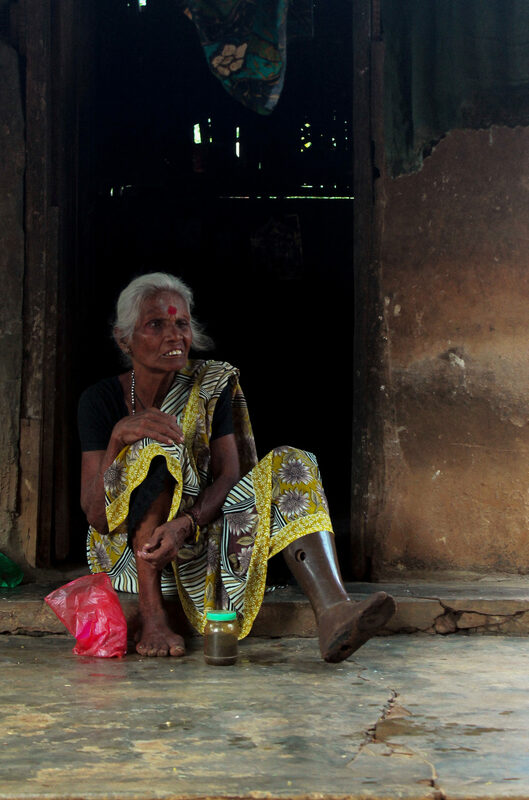 24 November 2017 This house is owned by an old mother called “sellamma” After a continues protest done in 2015 by “sellamma” she was able to get released her huge house at Pudukudiirippu, which was taken away by SL Army during the time of war and was not released later. The house was used by army troops of “Gajaba Regiment” as the remains in her wall provide the evidence. All electric plugs, Toilet comodes, sink basins of the house has been taken away by Army when they were leaving the house. 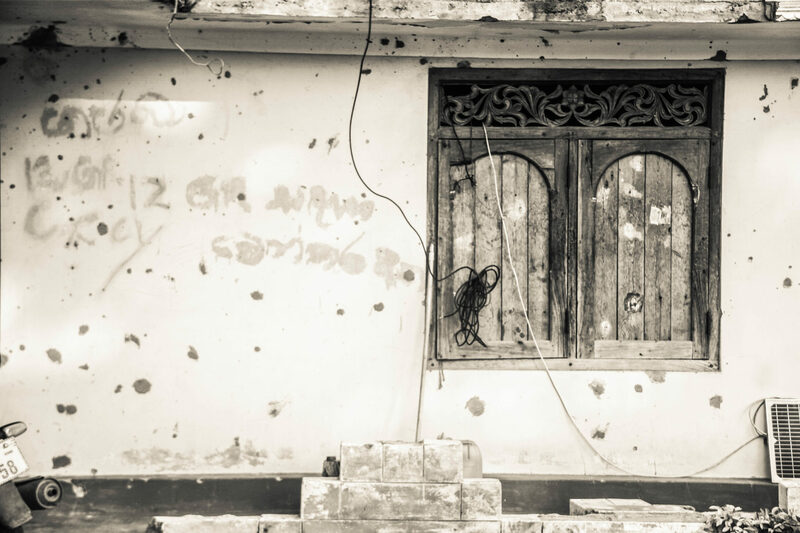 The holes made by the bullets of war are still visible at her wall. 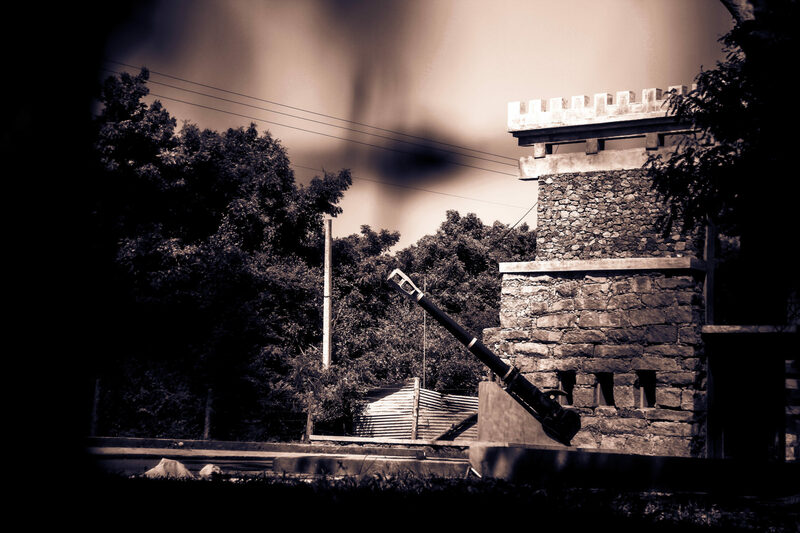 24 November 2017 photograph taken from the protesters hut at Kepapilav, of the Giant Entrance Gate of the Kepapilav Security Force Headquarters, at Mulativu. Inside the Headquarters are acres of land acquired from civilians, and are not yet being released. 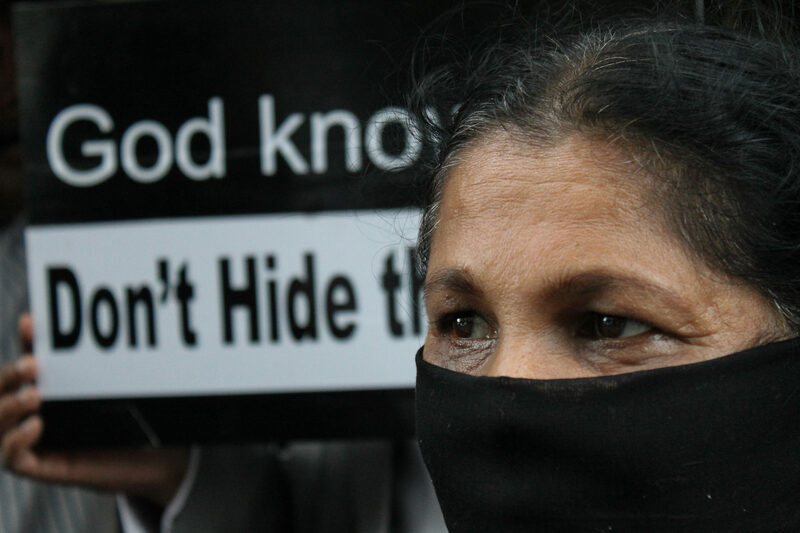 Enforced disappearances happened in the South of Sri Lanka too, however nearly thousands took place in the North over the last 30 years. Loving parents in the North are still waiting for their disappeared children, husbands and brothers. They haven’t given up their struggle to find them. The only souvenir they have is a photograph in their hands. ලංකාවේ දකුණේත් අතුරුදහන් කිරීම් සිද්ධ වුණා. හැබැයි පසුගිය වසර 30 පුරාම උතුරේ සිදුකරන ලද අතුරුදහන් කිරීම් ඉතා විශාලයි.නමුත් උතුරේ මව්වරු තමන්ගේ දරුවන්,සැමියන්,ආදරණියන් සොයන එක තවමත් අතහැර නැහැ. ඔවුන් තාමත් බලා ඉන්නවා තමන්ගේ ආදරණියන් කවදාහරි එයි කියලා. තමන් සතුව ඇති අන්තිම මතකය විදියට මේ බොහෝ මව්වරුන් අත දැන් ඇත්තේ පන මෙන් සුරකින තම ආදරණීයන්ගේ ඉරි පළුදු වී ගිය එකම එක ජායාරූපයක්ම පමණයි. 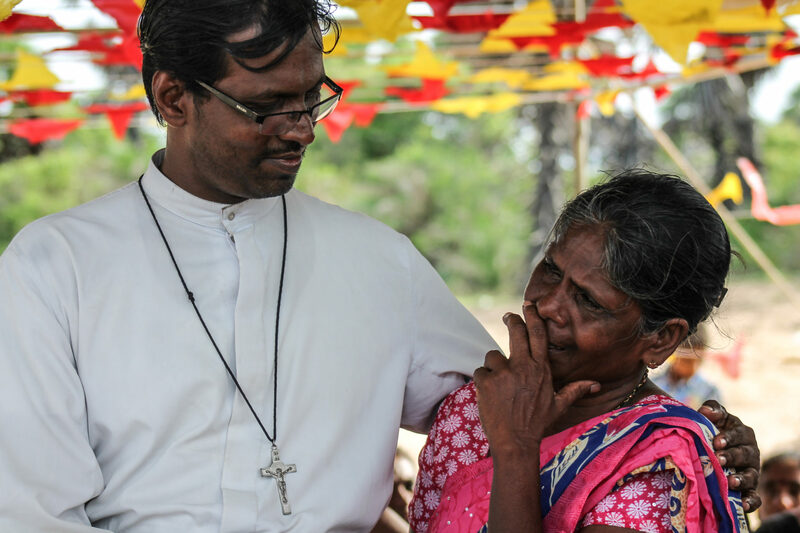 July, 2017 Kilinochchi Father seeking his Child at a disappeared Relatives Protest. 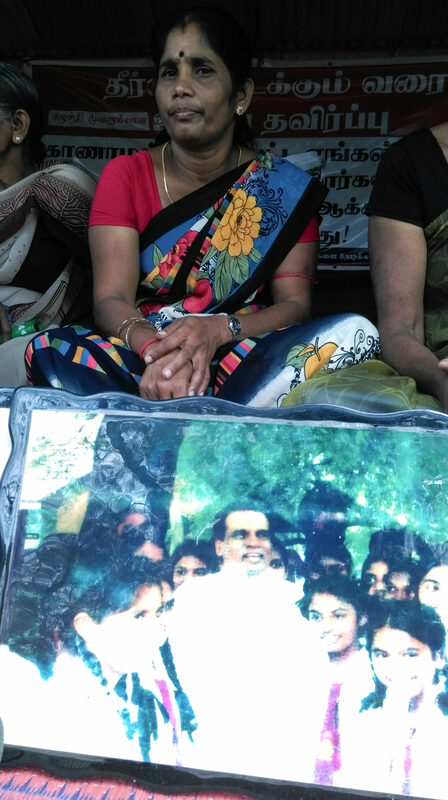 These Parents say their children are not disappeared, On 17 th May 2009 they have given their children to the Sri Lanka Army, Now they ask where are these children they have given to the SL Army? 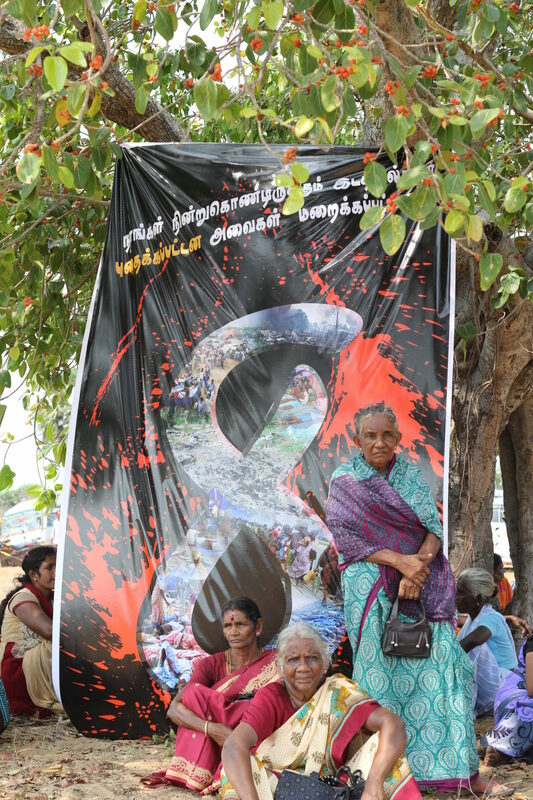 2012, April, Viharamahadevi Park, Colombo At a Protest Demanding Justice for the Disappearance of the Political Activists Lalith Kumar Weeraraj and Kugan Muruganandan in Jaffna. 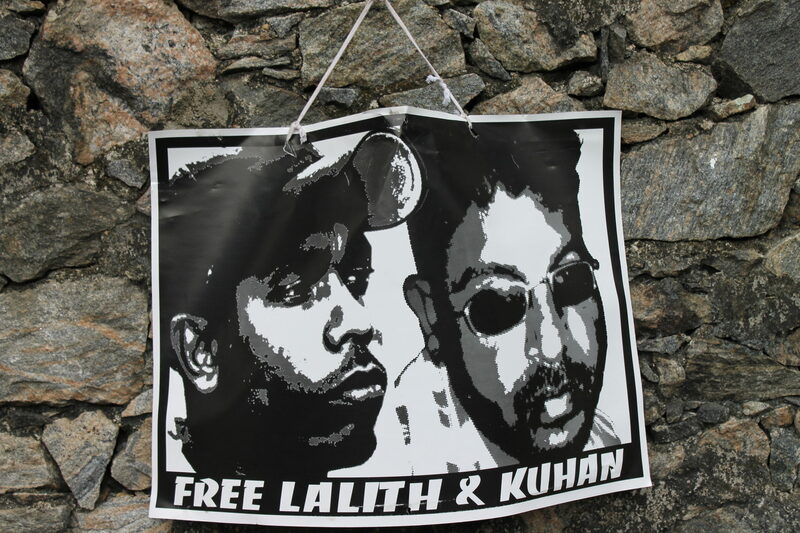 Both Lalith & Kugan left Kugans house on December 9th on a motor bike and never returned home on a day before the international human rights day to organize a media discussion. 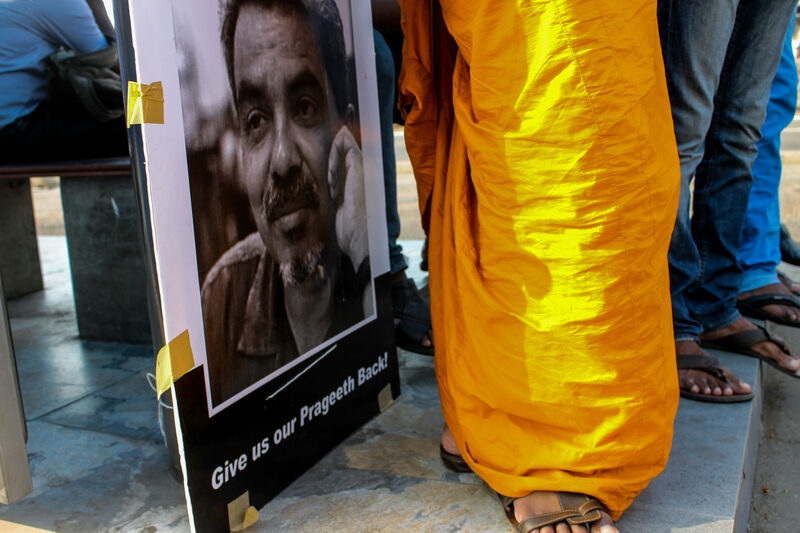 February 2012 In Front of Sri Lanka Parliament Sandya Priyangani Eknaligoda demanding justice for her husband journalist Prageeth Eknaligoda who went missing since January 24th, 2010. 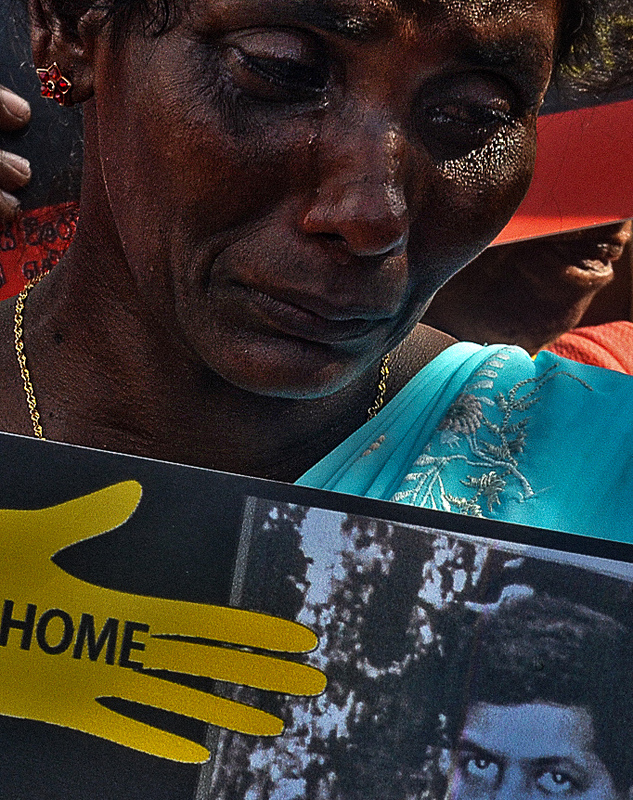 April, 2015 Vavuniya – A mother seeking her Child at a disappeared Relatives Protest. 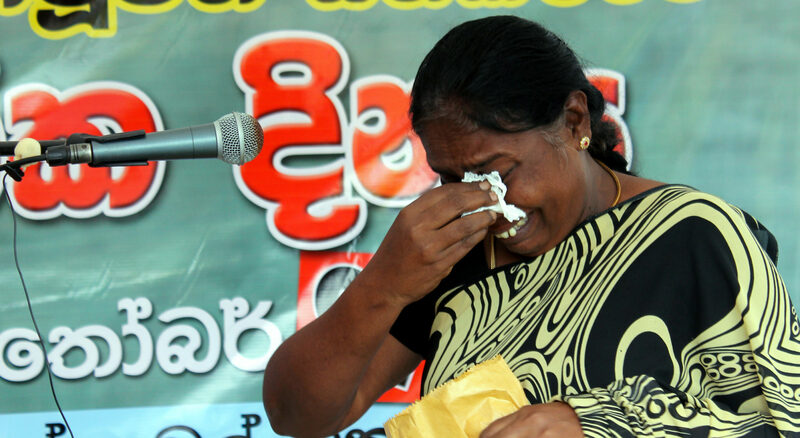 Significance of the photograph, she has in front of her self is that this mother has seen her daughter with the President Maithripala Sirisena which appeared on a newspaper in 2014, and she asks what has happened to her then? 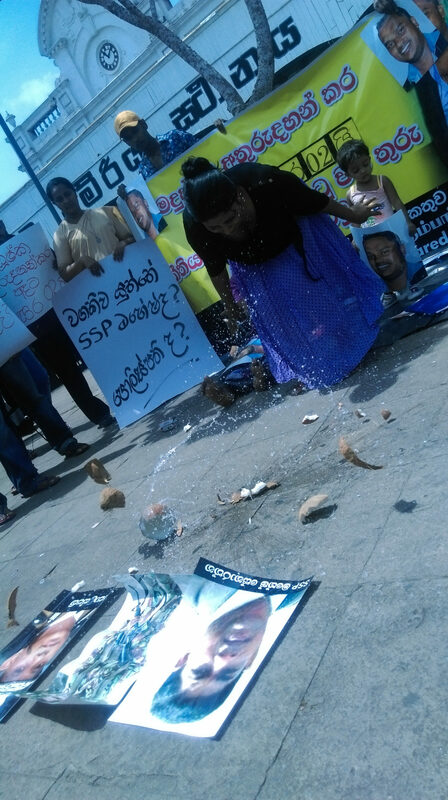 2016, Colombo Fort: A determined young wife Mayuri Inoka Jayasena protests in front of Colombo Fort with her two children demanding that justice be served to her, whose husband was allegedly abducted and went missing since 2013. There are no places to build tombs for people killed during the war. 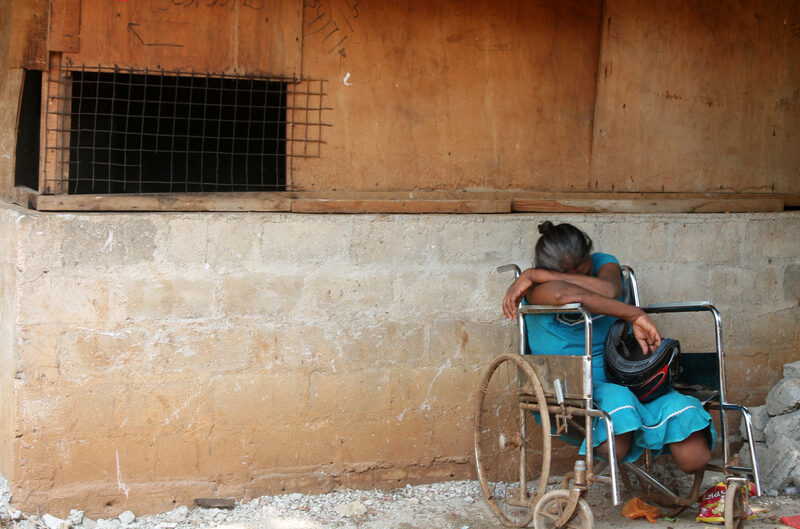 The Sri Lankan hegemony, which justified the war, has usurped any rights they had. It hurts the mothers in the North who cry for their children, writing their names and present on stones to preserve their memory. The above memorial statue is to remember Rev. Elil Rajendran who was assassinated at the final phase of War in 2009 while helping out the civilians to escape who were trapped in the area of Nandikadal lagoon. This picture was taken at May 18, 2017 Mullivaikkal, Mulathivu. උතුරේ යුද්ධය විසින් මරා දමන ළද මිනිසුන්ගේ සොහොනක්වත් ඉදිකරන්නට නොදෙමින් යුද්ධය සාධාරණීකරණය කරන ලංකේය හෙජමොනිය තව දුරටත් පිඩනයට පත් කරමින් සිටින්නේ ,තම දරුවන්ගේ මතක වත්තුව වන නම් ගල්වල කොටා එම ගල් බදා වැළඳගෙන හුස්ම නොගෙන සුසුම් සමඟ තවමත්වැලපෙන උතුරේ මව්වරුන්ය. 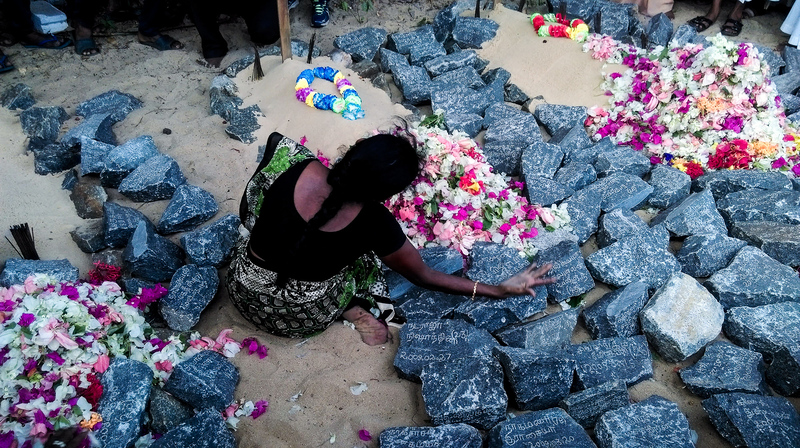 A Mother cries over her children, writing their names and present on stones to preserve their memory, since legally Sri Lankan Government prohibits to build tombs in the name of the ones who were killed at the final phase of war. 17th May 2017, Mullivaikkal Remembering loved ones killed by the war in the North. 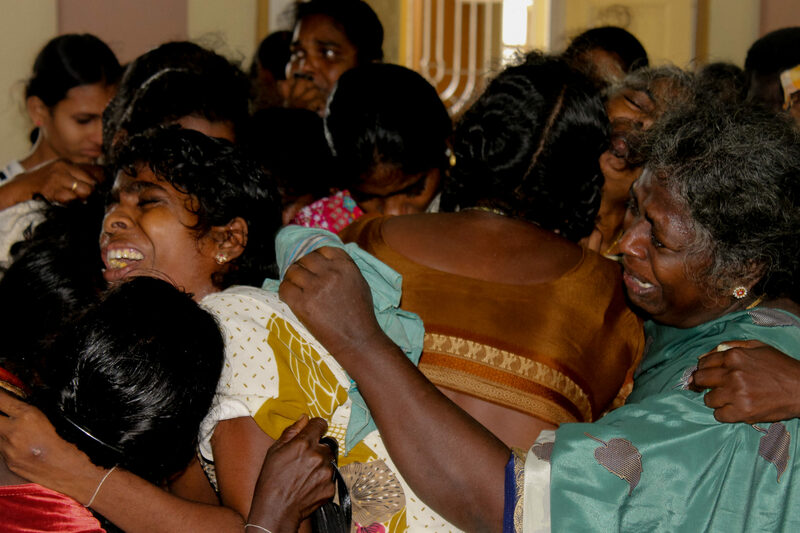 Relatives Performing Religious practices after 8 years, weeping over loved ones. It is a symbolic representation of the massacred civilians at the war. A mother Sharing her tears, pain of and the loss of loved ones with a Rev. who was present at the remembrance while listening dearly to her. 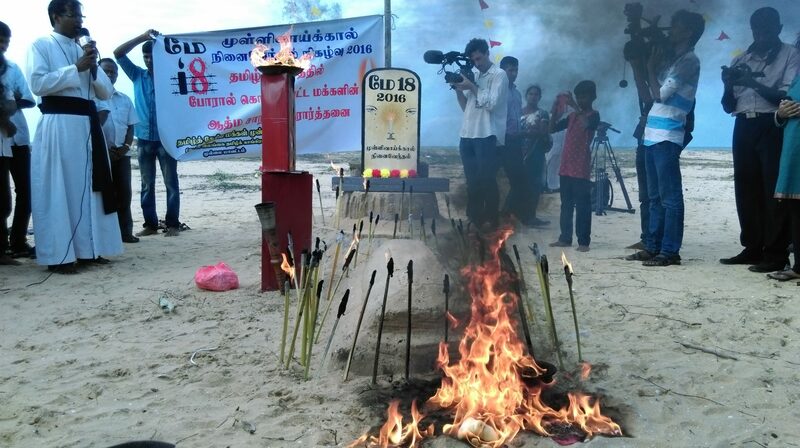 17th May 2017, Mullivaikkal Beach Remembering loved ones killed by the war in the North. This beach is significant since this was the last place where civilians ran for their lives at the final phase of the war, who were trapped. From here onwards it is the huge sea. Many died and there is no any record of the number of people who died here in this beach. 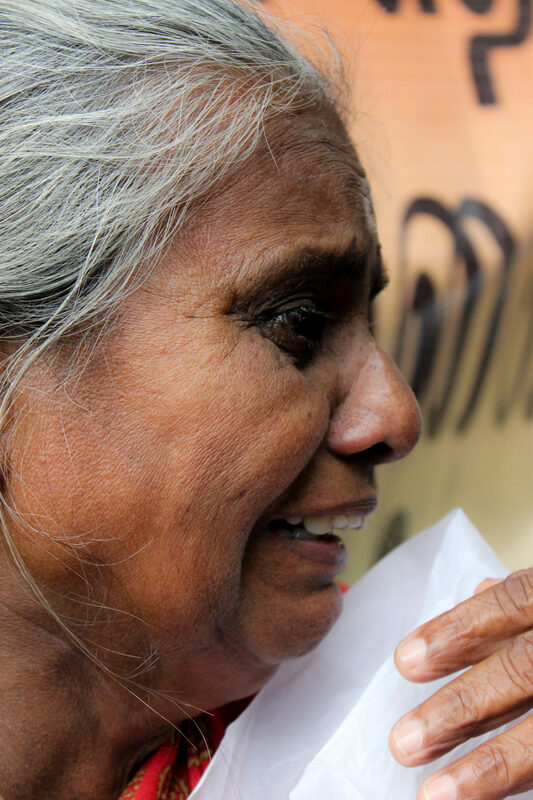 Mother cries over her children, writing their names and present on stones to preserve their memory, since legally Sri Lankan Government prohibits to build tombs in the name of the ones who were killed at the final phase of war. 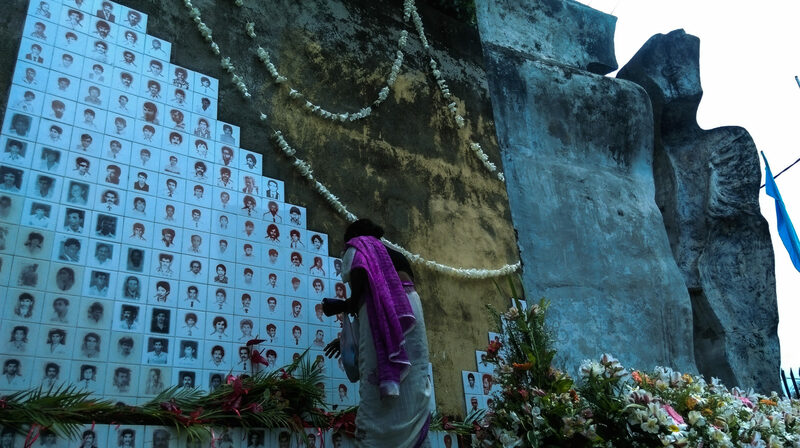 17th May 2017, Mullivaikkal Remembering loved ones killed by the war in the North. Endless weeping of women, men, children, relatives over their loved ones who were killed at the final phase of war. 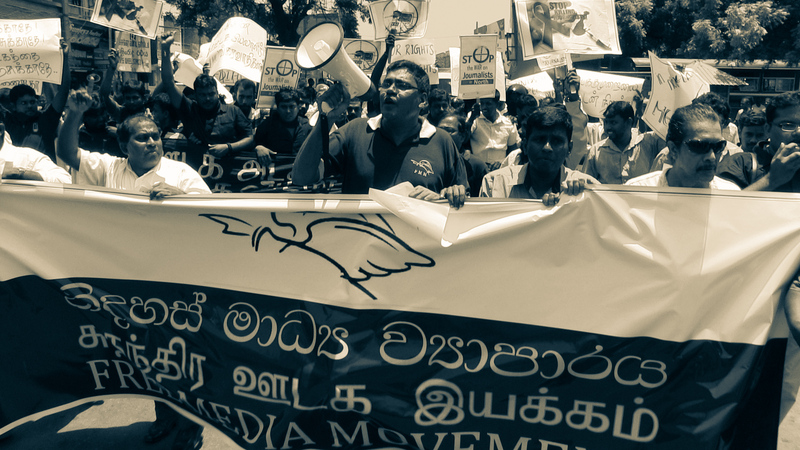 Journalists from the North and South in Sri Lanka have been accustomed to death threats, harassment and sometimes assault. And continuous pressure on media institutions and individuals were prominent during the previous government. This led to serious threats on the Freedom of Expression. 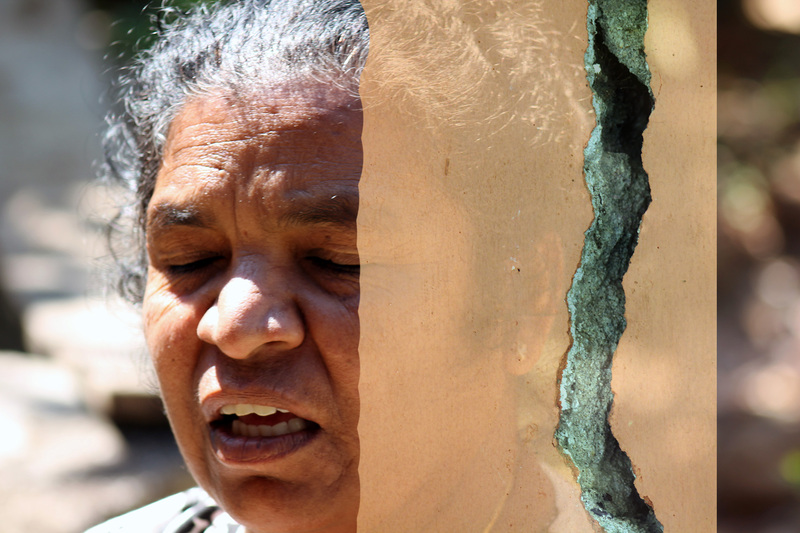 Even after the Sirisena-Wickremesinghe government came to power they have not taken any progressive steps to end impunity or to bring delayed justice to these significant cases reported. 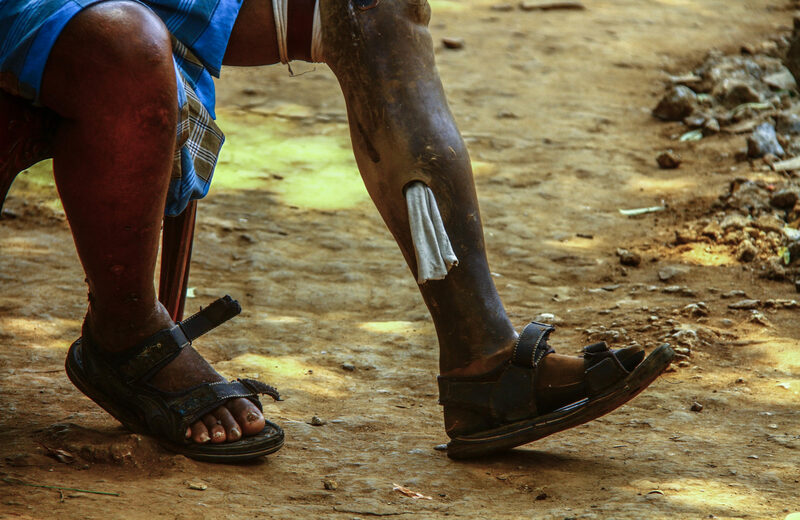 Featured image is of a Tamil journalist from the North Gunasundaram Kuhanathan, Editor of Uthayan News Paper, Jaffna (after the attack on the Uthayan office). උතුරේත් දකුණේත් ජනමාධ්‍යවේදීන්ට පසුගිය කාලය පුරාම එල්ල කළ තර්ජනය කිරීම්, ඝාතනය කිරීම් ගණනින් ඉතා විශාලය. එයිනුත් උතුරේ දෙමළ භාෂිත ජනමාධ්‍යවේදීන්,ආයතන හා ක්‍රියාකාරීකයන්ට එල්ල කරන ලද තර්ජනයන්, කළ මරා දැමීම්, ගිනිතැබීම් යට ගසා අමතක කරවීමට ගත් උත්සාහයන් අපමණය.අද දක්වා දෙමල භාෂිත එකදු ජනමාධ්‍යවේදියෙකුටවත් යුක්තිය තබා, යුක්තිය ඉටුවන බවක් පෙනෙන්නට වත් නැත. 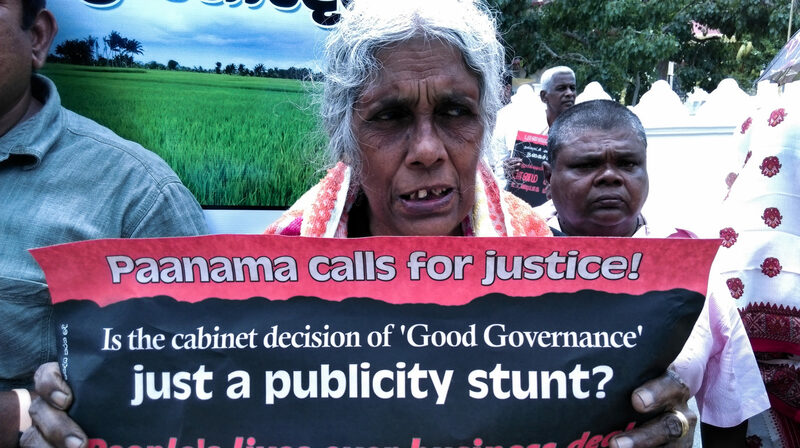 April 2015, Colombo Fort: At a protest demanding Justice for Sivaram’s murder, After 10 years forcing the government to act on the murderers. Taraki Sivaram or Dharmeratnam Sivaram [11 August 1959 – 28 April 2005] was a popular Tamil journalist of Sri Lanka. 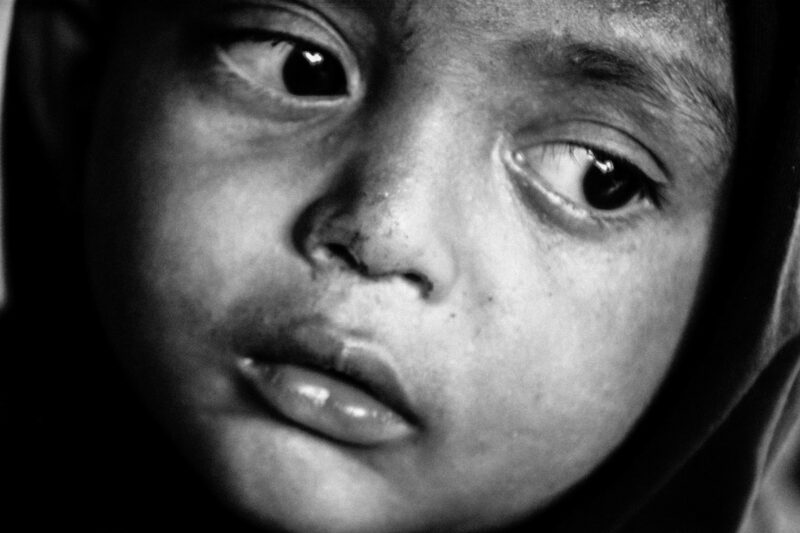 He was kidnapped by four men in a white van on 28 April 2005, in front of the Bambalapitya police station. 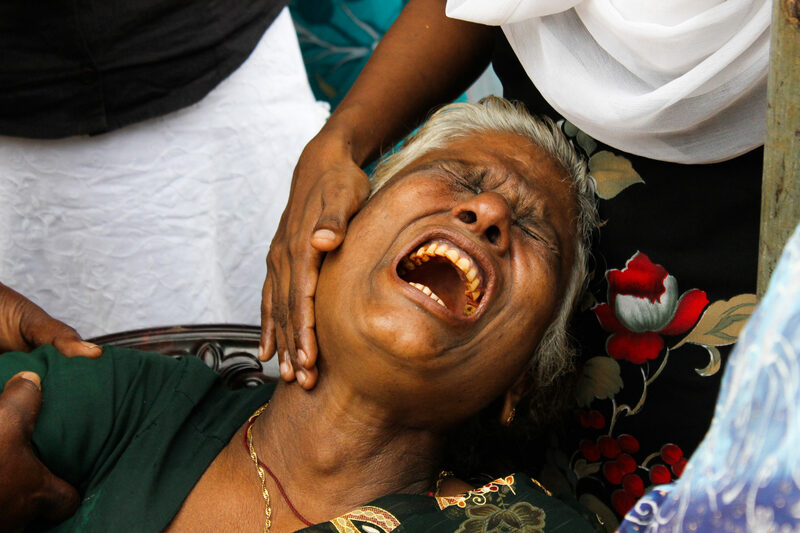 His body was found the next day in the district of Himbulala, near the Parliament of Sri Lanka. He had been beaten and shot in the head. 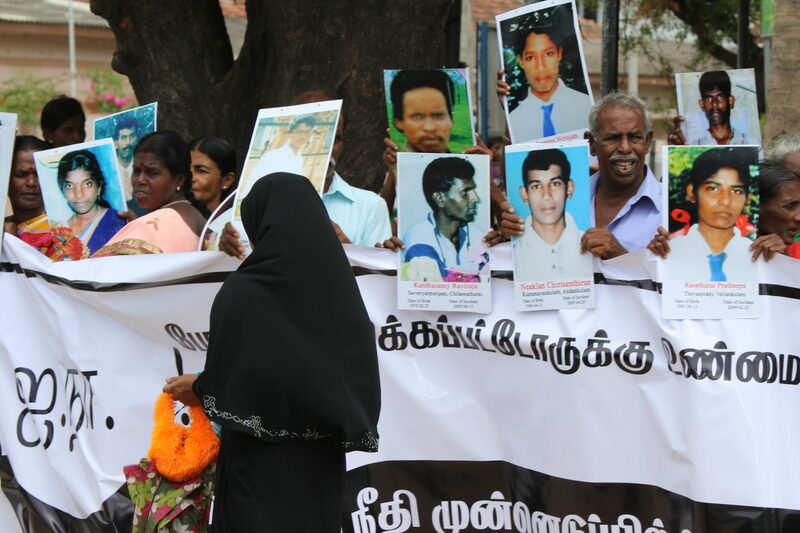 23 January 2015 Protest held at Colombo Fort marking 5 years without justice for the Missing of Prageeth Eknaligoda. Prageeth Eknaligoda is a cartoonist, political analyst and journalist. He was reported missing on January 24, 2010 – two days before the presidential polls in Sri Lanka, while working as a freelance journalist for the website Lankaenews.com.Members of his family believe he has been abducted by pro-government supporters because he was investigating the alleged use of chemical weapons, charges that was denied by the government of Sri Lanka. 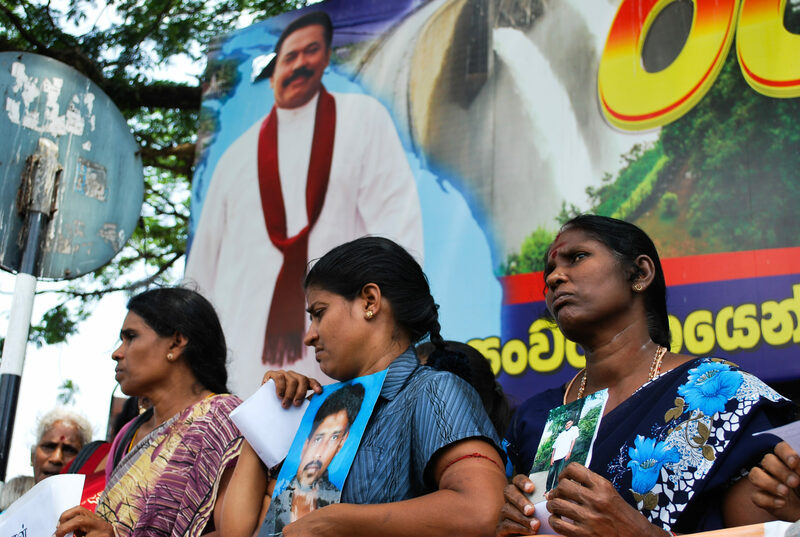 January 2015 Black January at Viharamahadevi Park Vigil calling to bring forward the killers of Lasantha Wickramathunga in front of the law. 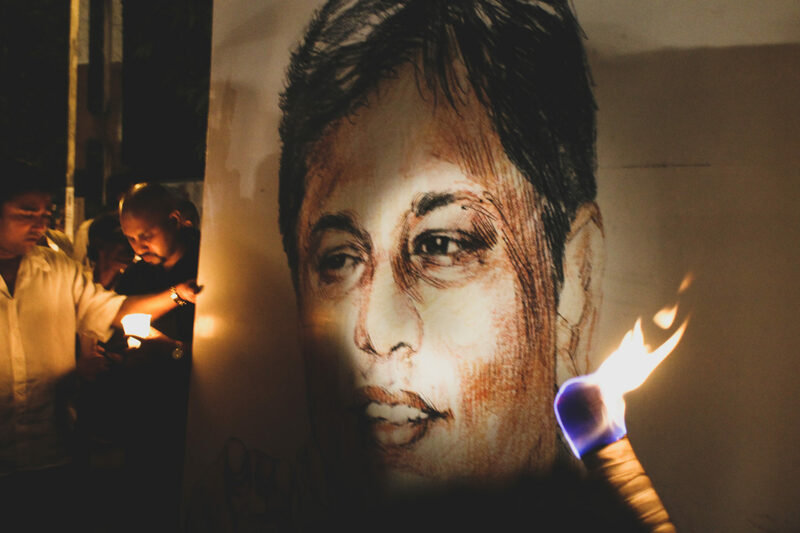 Lasantha Manilal Wickrematunge (5 April 1958 – 8 January 2009) was a Sri Lankan journalist, politician and human rights activist who was assassinated in January 2009. Wickrematunge was the founder of The Sunday Leader and Leader Publications Wickrematunge’s assassination caused a national frenzy being the country’s most influential media personnel and one of the biggest political figures and raised questions about freedom of expression in the country. 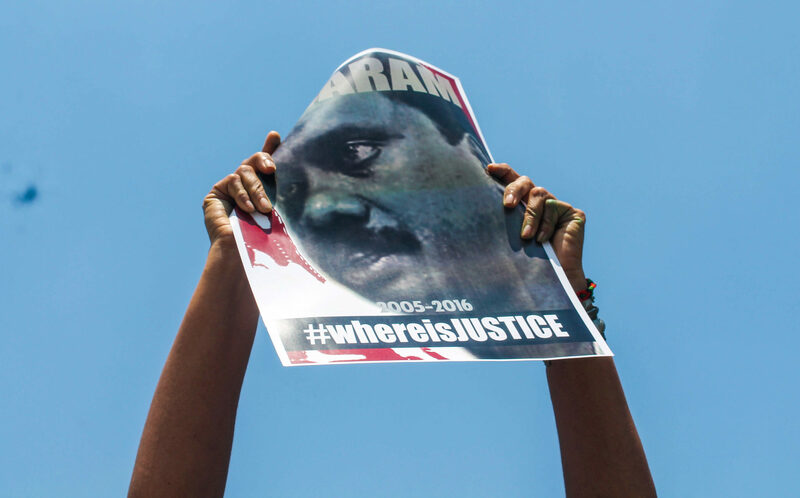 Wickrematunge’s murder was widely condemned across the world. 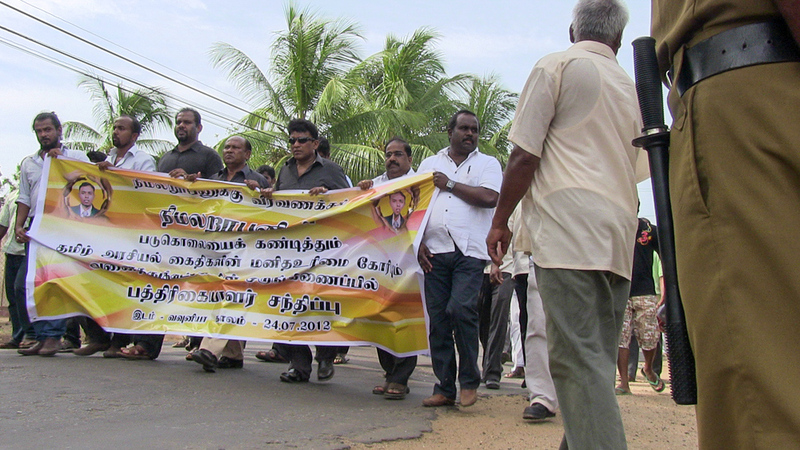 January 2014 Jaffna, At a protest organized by the Free Media Movement and the Journalists from Jaffna. There were lot of attacks, killings and threats took place against journalists during the above period in north. 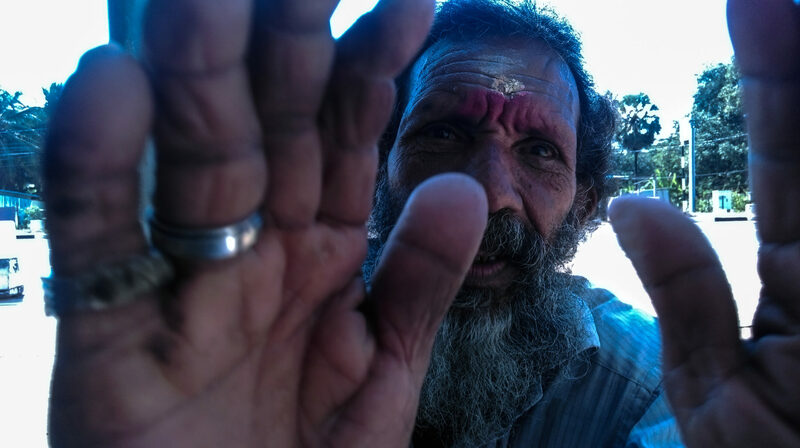 But violence against journalists from the North, working in the Tamil language, has remained forgotten in the search for justice, something they have long been denied, until now. This was a protest against such brutal attacks and killings. 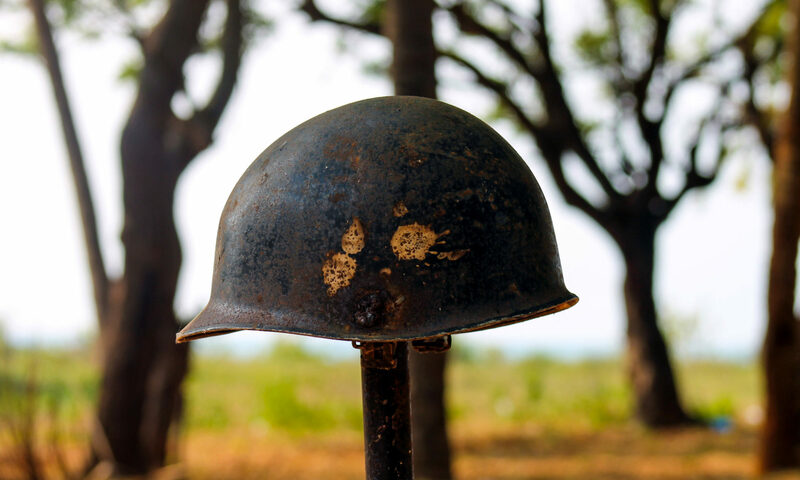 It has being 8 years since the war came to an end, with thousands of casualties in the last battle. 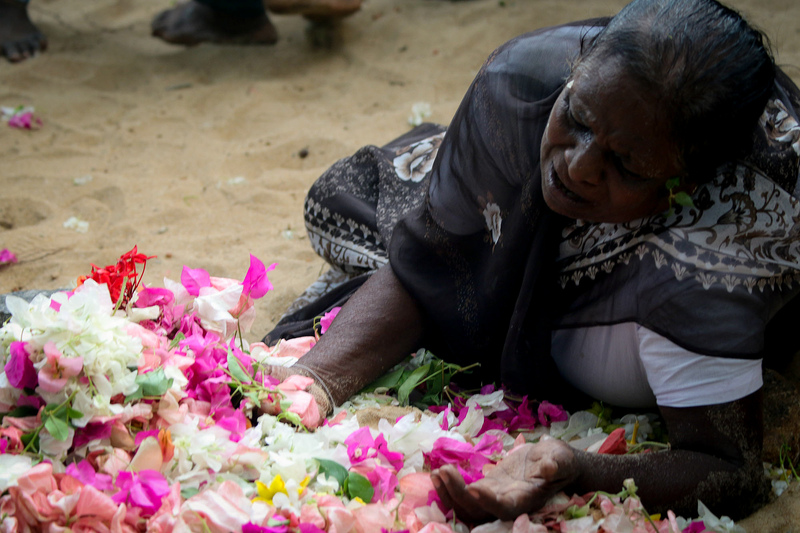 many in this country have only seen or heard of the victims on the television or radio, the ‘poor innocent Tamil’ people affected by the war. Who are these people really? There are people living without dignity in so called ‘welfare Camps’ after they lost everything, only their lean bodies remain. 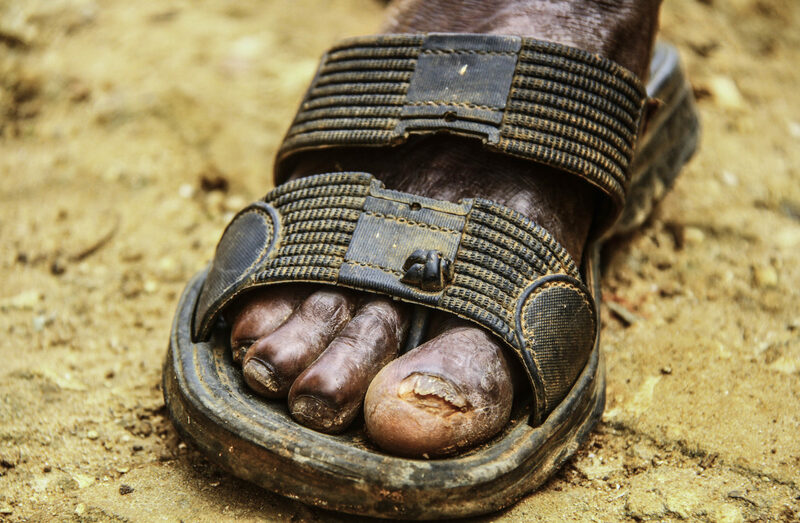 Life is not easy for them and they don’t have the energy to bear the daily burdens they face. Location: Welfare Camp at Mallakkam, Jaffna, taken on 20th November 2017. ඝාතනයෙන් කෙළවර කරන ළද මිනිස් ඔළුගෙඩි යුද්ධයෙන් වසර 8ක් ගෙවී අවසන්. මෙරට බොහෝ දෙනෙකු ඇහැට දැක නොමැති රුපවාහිනියේ හෝ ගුවන් විදුලියේ පමණක් ඇසු “යුද්ධයේ වින්දිතයන් බවට පත්ව ඇති උතුරේ වෙසෙන දෙමළ ජනතාව” යනු කවුරුන්ද? එහෙව් පිරිසක් සිටීද? තම පනකෙන්ද පමණක් අතැතිව වැහැරි ගිය ශරීර වල අස්ථන්ව ගිය ගැහැනුන් මිනිසුන් මේ රටේ තවමත් “සුභසාධක කඳවුරු” යනුවෙන් අටවන ළද ඊනියා නාමයකට යටව අභ්‍යන්තරව අවතැන් ජිවිත ගත කරනවා. ඔවුනගේ ජීවිතය සැහැල්ලු නොවනවා පමණක් නෙවෙයි මුහුණ දෙමින් සිටින ජිවිතයේ බර දැරීමට තරම් වත් ශක්ති ප්‍රමාණයක් ඔවුන් සතුව තවදුරටත් ඉතිරිව නෑ .